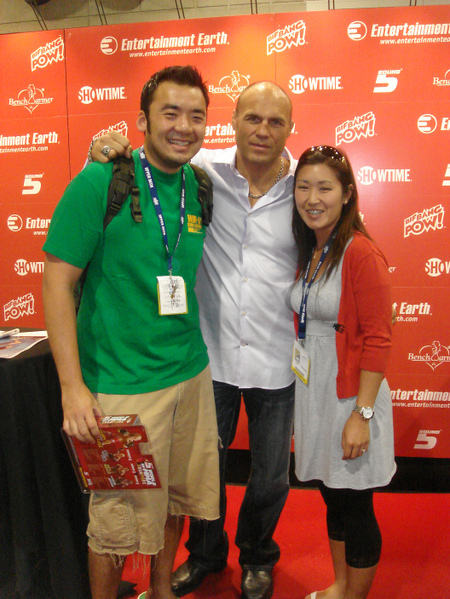 Look Randy Couture got to take a picture with Marika! And by the way, shaking his hand was like shaking hands with a baseball mitt. Big. So I know I'm pretty lucky. I've been able to play some really nice golf courses in the last few years. They're famous, and pretty and some people fly a loooong way to play them. Whatever. Here's the real deal. This is the most enjoyable golf course I have ever played. This is the Wawona Golf course. It's in Wawona California. For those of you not in the know, Wawona is just 4 miles from the south entrance of Yosemite National Park. Now I've never stayed at the Wawona Hotel, I did walk around it and it was really pretty in that old school California way. Frontierish. But back to the course. It's only 9 holes, short and to be honest I can't even remember any of the golf. Don't have a clue how I played. Don't even know what year it was. BUT, I remember the place. It's beautiful. Not in the manicured cared for country club way, but in a natural no rain, no green way. There were no stuck up rich folk, no 7 dollar beers, no dress codes. Just an amazing environment and a great place to be with friends. Just watch out for the stag with the gigantic horns. He could ruin anyone's vacation. So no surprise to anyone but I'm a bit of a golf nerd. A very lucky one though. I have a friend who has a relative who has a friend who's close to a relative of a friend of a relative of one of these two girls. Confused? You're supposed to be. Well my friend was kind enough to give me a ticket and to see the Kraft Nabisco Championship, one of the LPGA's 4 major tournaments. And my two favorite ladies were even paired together! Oh happy day! Anyways, so I got to the driving range early and got to see Ai Miyazato (short one) hitting balls and well...holy cow! She's all of 5ft 1 and is freakin awesome. As with most things, top professionals are just better. Waaaaaaaay better. And, er...she's really cute in person. Then there's the other chick. If you really enjoy golf, you NEED to see Michelle Wie in person. She has the potential to be era defining for golf. So pretty excited when she walked out to warm up. I was ready to be impressed but I was NOT ready for how big she is. I'm 6ft ish and not small, but she's looks huge. Definitely my height, and possibly taller, seriously. And as skinny as she looks on TV, in person she's not. What I mean is when you see her in person, she's an Athlete (note the capital A). She's tall, broad shouldered and strong. Now, I'm not saying she's manly but you look at her and she's kind of intimidating. And she hits the ball like you would not believe. A really well struck golf ball makes a certain sound. A professionally struck golf ball makes an even more distinct sound. A ball struck by someone who's world class is completely different. She's world class. She may not be as fluid as some (Ai) or as strong as some but the her game is incredible. So I'm a golf fan, would've enjoyed the day matter what. But even coming in with high expectations I was blown away. Michelle Wie is all that. If you don't think so just go somewhere else because she is. And er...in person AI Miyazato is Uber cute. Well she pretty much steamrolled em. She set a record for largest margin of victory at LPGA Q school and Japan is going to go even crazier for Ai. Good stuff. So if you're wondering how big she is in Japan here's a neat little fact. In November Tiger Woods played in the Dunlop Phoenix Open in Japan. 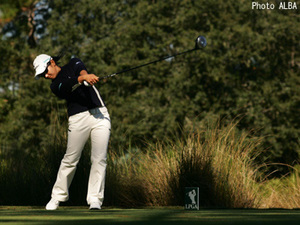 He led every round in his win, but on Sunday the telecast of Ai Miyazato winning the Elleair Ladies open outdrew him. Not too bad. I'm really hoping that she has a fabulous year on the LPGA tour. I'd predict top 30 on the money list and 4 second and third place finishes. Depending how many tournaments she plays I think she will win one. If she plays more than 15 tournaments I think she'll have a victory but if she spends too much time traveling between Japan and America trying to play both tours I think it will be difficult. But I've got my fingers crossed. Her playing partner speaks highly of her and she seems like a nice gal, so I'm hoping for the best. 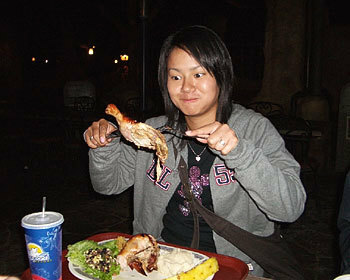 Now lost in the shadow of Ms. Miyazato is this little lady. This is Shinobu Moromizato. 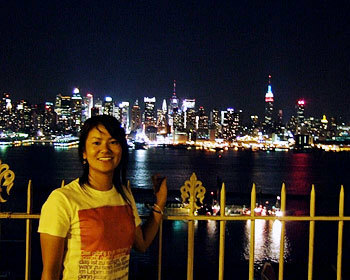 Until recently she was Japan's leading amateur golfer. 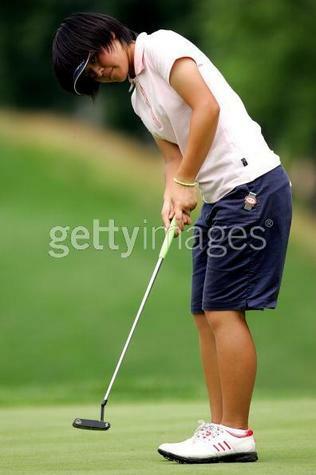 She had a very good amateur career and is expected by most Japanese golf fans to be a very good professional. I don't think people expected her to try the LPGA tour school though. So I expect there are some very happy fans out there because she too has gained full playing privileges on the LPGA tour for next season. I do have a particular interest because I have one of her putters. Well kind of. Gauge Design Japan makes the putter she uses and personalized one for her. I believe they made 5, one of which found its way into my hands. It's pretty cool, it has her name on the back and a little piggy face on the front. you can just make it out in the photo. Regardless, I really hope she too does well on the LPGA tour though she doesn't have the resume of Ai Miyazato a number of people do have high expectations for her. Me? I don't think she'll be in any danger of losing her playing privileges (by finishing higher than 100 on the money list) but I don't really know enough about her to say more. She'll do okay, somewhere between 50-75 on the money list. Safe but not creating a firestorm, though I do hope I'm wrong. So congratulations to all the women who secured their playing privileges for next year and best of luck! Now do you know who this is? I'll give you a prize if you do. Well it doesn't help when you see her like this. It would probably help more if you saw her in her element. This is Ai Miyazato, she's a golfer and she's Japan's biggest athlete. In her first 2 years on the LPGA of Japan she won 11 times and also captured the Womens World Cup of Golfwith partner Rui Kitada. She has taken Japan by storm and has brought lady's golf in Japan to a level it's never experienced. When she's in contention to win she routinely outdraws the men's golf telecasts. Impressive. She's also 20 years old (Jun 19 85) and 5 foot 1. Not bad. And as of today (Dec. 2 05) she's on track to take America by storm. 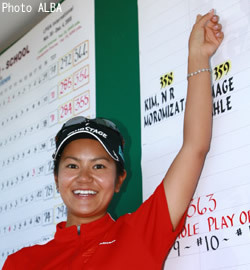 Through 3 days of 5 at the LPGA Tour Qualifying Tournament shes leading by 7 strokes and looks very good (knock wood). The top 24 finishers at the Qualifying Tournament get full status on the LPGA tour. Now I'm not saying she's going to repeat her success on the Japanese tour in America but for Japanese golf and for Japan it's a huge deal. The Japanese are obsessed with their athletes playing abroad (Ichiro, Hidetoshi Nakata) and it will continue with Ai. It's a great thing for the Japanese and if she does well here on the LPGA tour it will be great for America too. if you don't know who this is (and you really should) it's Michelle Wie and she's a golfer. I know everybody at some point has seen it. It's on sometime between Christmas and New Years and it's fascinating and freaky all at the same time. It is the The World's Strongest Man. And in October of 2005 in Chengdu, I was there. Now I don't want you to think I'm following the strongmen around or anything. A good friend of mine works with the company that was doing the marketing for the competition in China. So for sh*ts and giggles we decided to go. It didn't hurt that Chengdu is the home to the Chinese Panda Nursery, but more on that later. We only saw the final round of the competition, but really it was enough. Not in a bad way, its actually very impressive and pretty cool what these guys are able to do. But it's frightening how big these guys are. I'm not a small person but they DWARF me. I mean huge people. The shortest was around 5' 11 but, well they're just immense. They make me feel like a small child. Biceps the size of my thigh and, really I can't even begin to describe how big these guys are. They're also very scary, an angry strongman? Well, just hope it never happens. But it was a neat event with good crowds and blah blah blah. If it's in your area, check it out. If you miss it, well I won't hold it against you. And if you're interested this is the winner Mariusz Pudzianowski. He was actually a great champ, he was really funny and loved the crowd. He even grabbed this little Chinese cheerleaders pompoms and did his own little cheer. Good stuff.